It was different from all the other stores in the Bookstop chain. The people who worked there had a certain attitude--not quite as "customer-friendly" as the one trained into Bookstop employees in different stores. The attitude came with the neighborhood. Their customers seemed to expect and even like the rudeness, much as tourists crave the same from NYC cab drivers or the French. Such attitude gives us stories that usually end with a shake of the head and a slow smile of acceptance that we've joined a community of the skillfully insulted. 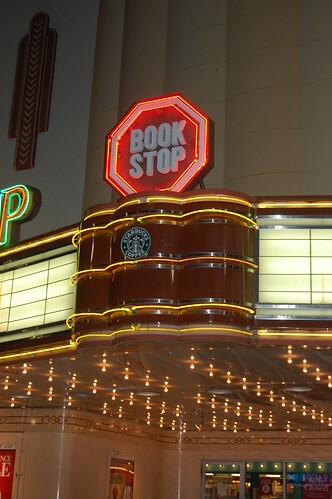 When Barnes & Noble bought the chain, only the Alabama Theater Bookstop got to keep its name, as if to reassure customers that nothing important to them would change--and the exterior, with its blazing marquee and art deco facade, rated high on the list of importance. 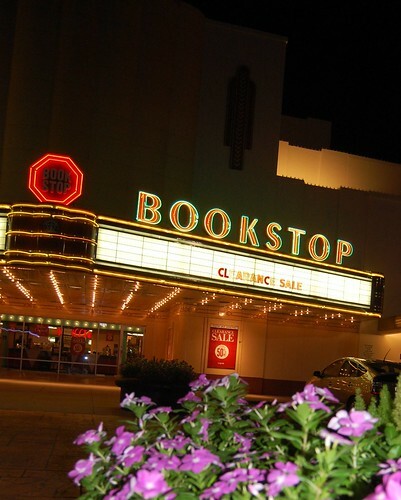 Over time, Bookstop's next-door-neighbor, Cactus Records, disappeared, but Whole Earth Provision Company expanded to fill the empty space. Another neighbor, Whole Foods, moved to a new location across from the Borders down the street, but was replaced by a Petsmart. The copy place turned into a restaurant, then a different restaurant, but Bookstop stayed, lighting up the night, luring customers with the promise of multi-levels of book browsing, a magazine off the stand in the mezzanine, a cup of coffee or tea from the barista in the balcony, an impromptu conversation with a fellow shopper, and beautifully preserved walls and ceiling. Now B&N has been lured to a tonier address in a new development a few blocks away--across from the River Oaks Theater, also a beloved landmark. 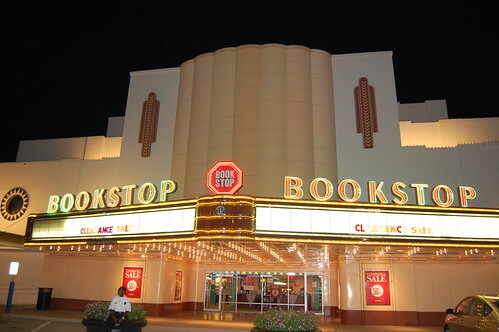 No one knows what will become of the Alabama Theater Bookstop, but we all know this is a city that loves to level and rebuild. So we wait and see what an improving economy will bring and hope developers are listening--the chatter seems to have made them back off a plan to tear down the River Oaks theater, at least for now. 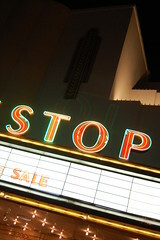 On the night when I took these photos, the doors of the Alabama Theater Bookstop closed for the last time not just on a store, but on a piece of my history. It was here I met a person who would reshape my personal and political landscape in ways I never imagined. I miss him. And I will miss this place.